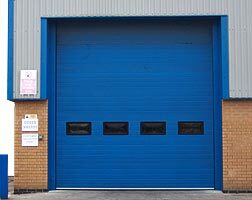 If you are based in the Northampton area and looking for a supplier of Industrial doors, Shutters and Security products, Samson Doors based in Wellingborough should be your first choice. Samson Industrial Doors specialise in providing services to commercial, residential and industrial premises focussing on security, energy conservation and reliable maintenance. Having been trading for over 20 years Samson have built a reputation for total dependability in the security doors, windows and shutters sector. High speed or 'Fast Action' Roller Doors from Hormann are used for many applications where high traffic volumes require a door to keep a building environment as constant as possible. Warmth is kept in in the winter and warmth may be kept out in the summer depending on the buildings function. The fast action roller door also help to keep dust, rain and wind levels lower in a building. To find out more about the Fast action roller doors Click here. 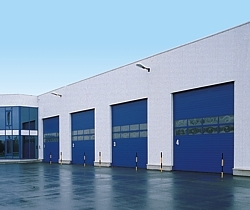 Sectional overhead doors offer the highest level of insulation and security. Samson Doors offer the Hormann range of sectional doors which we consider to offer an uncomprimising level of quality and reliability not just for the door panel and operating mechanism quality but also the highly developed and state of the art access control and automation door systems used. 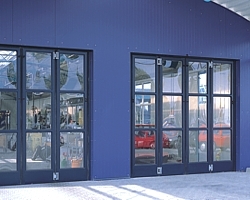 To find out more about the Sectional doors from Hormann Click here. Folding and Sliding doors from Samson Doors offer the customer the option of having the door glazed or made in solid steel. 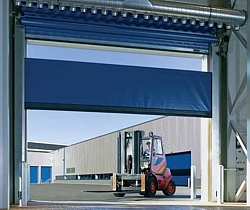 Sliding and folding doors are suitable for garage openings, perhaps for farm and industrial machinery or maybe for a warehouse where traffic is fast moving. To find out more about the Folding and Sliding doors Click here. Hinged steel doors are ideal for trade and industry and also for private use. They are strong and robust with high security specifications, making the steel doors for any remote industrial operation. They also come with escape doors should you need them. To find out more about the Hinged steel doors Click here. Samson Doors are one of the UK's leading security shutters specialists. If you wish to find out more about all of our Industrial Doors and Door Products we have available, please click here to visit our website. We operate in the following areas of Northants. Northampton, Kettering, Wellingborough, Daventry, Corby and most UK areas. contact us for details.